and you close your office doors against their noise. to use your electric stapler. they will find their creative hearts. 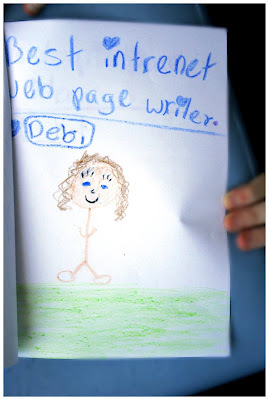 ah kids - arent they lovely the way they cheer you up with the little drawings and captions? the clumsily wrapped up pressies and "surprises"? they really do have this uncanny way of melting our hearts when we least expect it. beautiful. Ahhh, and you are the best internet web page writer ever!! Oh how I love this. Every word, right down to the electric stapler.